Students and R Club members can also swim during the aquatic center’s open recreation swimming times. To join or learn more, visit the R Club membership page. To ensure a comfortable and safe atmosphere for all patrons, please be courteous and respectful to others at the Goergen Athletic Center. 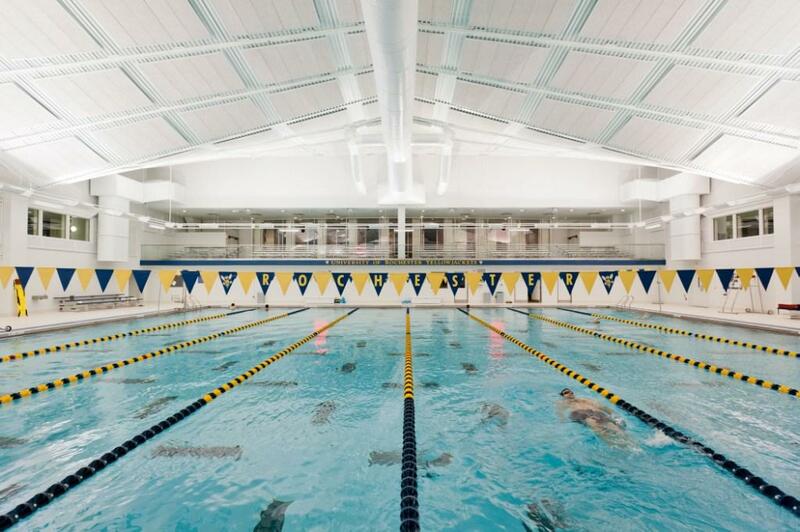 The aquatic center is available for use during open recreation swimming time with a full staff of University of Rochester lifeguards assigned. Please shower before entering the pool. Showering prior to entering the pool and the use of a bathing cap are recommended when using the aquatic center pool. Swimmers must wear a bathing suit; cutoff shorts are not permitted in the aquatic center. Always enter the water feet first. Feet-first entry is required for safe entry into the aquatic center pool. Please keep all glass bottles away from the pool deck. Plastic water bottles are permissible on the deck. All other food and drinks are prohibited. Always walk while on the deck to prevent slips and falls. Please respect the boundaries of all our patrons and lifeguards. Use of cellular telephones or tablets for photography or videotaping is strictly prohibited. Keep all pets at home. Service animals are welcome in the aquatics center. Diving boards and starting blocks are only for the University’s swimming and diving teams during supervised training sessions and meets. Children are always welcome in our facility. If your child is under 16, please accompany them to ensure their safety. At no time should children use swimmers or any other floatation device in place of a qualified adult supervisor. Children under the age of five are not permitted in the aquatic center. Restrooms and showers are available in each locker room adjacent to the aquatic center. Please refrain from spitting in the pool. Maximum number of people in the pool is 284, per University Fire Inspector. All swimmers are subject to passing a swim test before being allowed to swim. The test consists of swimming a full length of the pool without stopping to hold onto the side or stopping to touch the bottom of the pool. Those who pass the test will be allowed access to the aquatic center. You may be required to pass the test each time you visit the aquatic center. Violation of any policy set forth by the Department of Athletic and Recreation or any action deemed inappropriate may result in the participant’s membership being suspended or revoked. The Masters Swim Program provides training for R Club members to participate in competitive swimming and triathlon preparation. Trainings are held Monday, Wednesday and Friday 4 p.m.–5 p.m.
For more information, see the Masters Swim Program page.